The operation of an inductor filter is based on the fact that a minimum current flows through it at all times. 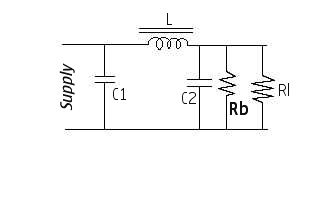 To provide flow of this minimum current at all times through the choke, a resistor called BLEEDER RESISTOR is placed across the filter output. Thus it is used to maintain a certain minimum current through the choke, even the load resistor gets open circuited, and improves the filtering action. The value of bleeder resistance should be such as to draw only 10% of total load current. It improves the Voltage regulation. Being connected permanently across the supply it causes an initial Voltage drop and on connecting the load their is a slightly additional voltage drop. Thus the Difference between the no load voltage and full load voltage is reduced thereby increasing the voltage Regulation. It provides the safety to the operator by providing a discharge path to the capacitor. When Power supply is switched off the filter capacitor discharges through it. That is why it is called BLEEDER RESISTOR. Bleeder Resistor can be used as Voltage Divider, for tapping out any desired output Voltage. In this case the bleeder Resistor may two or more Resistors connected in series.